Dogbane (Apocynum cannabinum) is the representative species for the dogbane family, Apocynaceae, which includes milkweeds and other plants that ooze sticky white sap ladened with poisonous alkaloids. Indeed, Apocynum translates to "poisonous to dogs," or "dog killer." Sap from dogbane is reported to have been used against ravenous feral dogs. The gorgeous iridescent beetles display a captivating array of colors that change with slight changes in your viewing angle. True to their scientific name, they may look like gleaming droplets of gold, or glisten with multiple mixed shades of green, copper, blue, and red. The secret to the myriad display of colors can be found just below the surface of the exoskeleton. Beneath an outer translucent layer rests stacks of tiny slanting plates that cover color pigments. Light rays striking the surface of the plates are reflected as a shimmering sheen, while light rays that bounce off the pigments produce various colors. The result is a lustrous mix of ever-changing hews; a kaleidoscope of colors that are almost unmatched in the insect world. Of course, the beetle's colorful display isn't meant to elicit "oohs and ahhs" from humans; it's meant to signal, "don't mess with me" to predators. 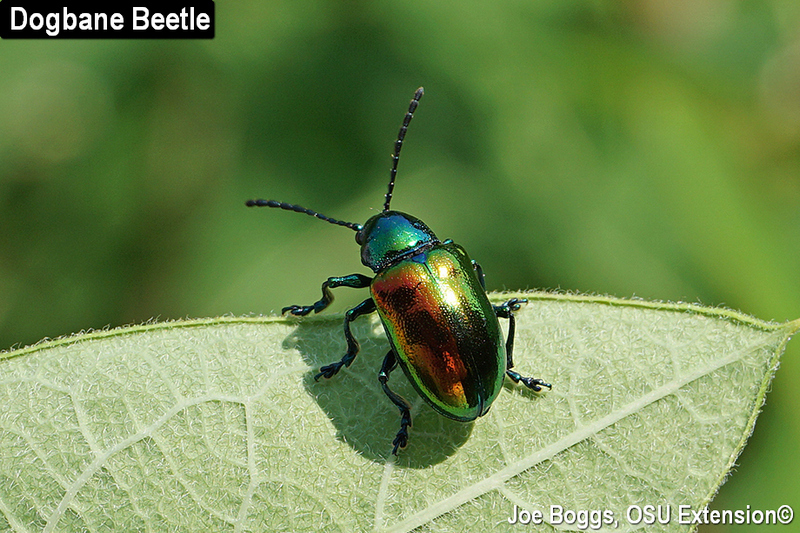 Dogbane beetles ingest the poisonous alkaloids (cardiac glycosides) in dogbane sap, store the chemicals in specialized glands, and then they secrete the noxious chemical brew when threatened by predators. Their bright coloration advertises their nasty chemical defense strategy. Using bright colors to send a warning message to enemies is known as "aposematic coloration."